When you sign in to iSpyConnect you will see your account page. 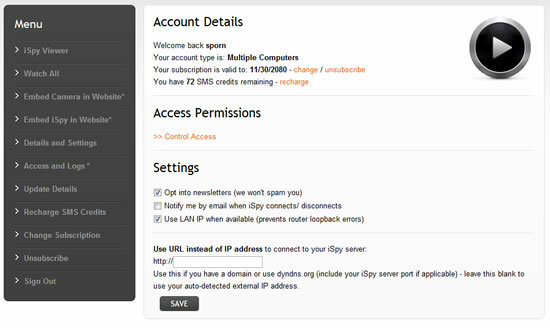 From here you can manage your subscription, control access permissions, modify your preferences, set up a DynDNS.org address etc. On the left of this page are quite a few options - we'll cover all these in the following sections. One of the options under settings is a connection/ disconnection alert option. Check this to receive alerts whenever iSpy disconnects or reconnects to iSpyConnect. If for example someone breaks in and steals your computer iSpyConnect will send you a disconnection alert immediately.